This is a bit of a mystery dog with undefined breed origins, except that is it known to come from Ireland. Its name is related to Glen Of Imaal, County of Wick Low, in Ireland. It was a versatile fierce hunter both above ground quietly capturing vermin, as well as going underground for foxes and badgers. While it has been found in Ireland for hundreds of years, it has only been recognized by the American AKC in 2004. Its look is reminiscent of the Welsh corgi or Norfolk terrier. 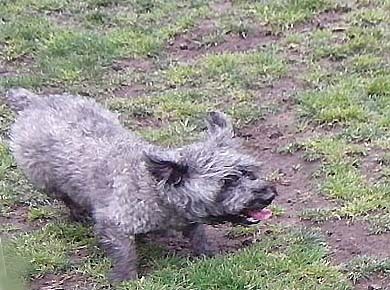 Sturdy in build with short legs for ‘going to ground’ after prey makes them a robust terrier. This dog is essentially two dogs in one. It is a loyal spirited family dog with gentle ways, yet on the hunt shows tenacious vigorous prey pursuit. They are known to be intelligent however their puppy stage lasts longer than many dogs, making training a trial on occasion. Because of their natural instinct and independence care must be exercised during training so as ‘not to hurt their feelings’. That is, they do not respond well to negative reinforcement or harsh tones or discipline, but without a calm persistent manner, they will quickly assume pack leadership. They are definitely not to be left alone with other small pets such as rabbits, hamsters and guinea pigs. They may also have difficulty socialising with other dogs. While generally good and playful with children, if under exercised and disciplined they will run the house and cause chaos. Their dig and chase predilection makes them a good retriever. Barking is usually limited to a genuine threat. Glen of Imaal Terrier grooming: Grooming is one of the easiest of all non-shedding dogs. They require the occasional brushing, but only need several baths a year. Hair stripping to thin the coat should be done about two times a year. The more critical requirement is trimming of the hair between the pads and under the tail. The ear hair needs to be plucked to thin it out, not cut. The Glen of Imaal Terrier sheds hardly any hair. This entry was posted in Terrier Dogs.